Organisation : National Pension System Trust NSDL e-Gov. ** The Government of India is extremely concerned about the old age income security of the working poor and is focused on encouraging and enabling them to join the National Pension System (NPS). ** Under the APY, the subscribers would receive the fixed minimum pension of Rs. 1000 per month, Rs. 2000 per month, Rs. 3000 per month, Rs. 4000 per month, Rs. 5000 per month, at the age of 60 years, depending on their contributions, which itself would be based on the age of joining the APY. ** The minimum age of joining APY is 18 years and maximum age is 40 years. ** Fixed pension for the subscribers ranging between Rs. 1000 to Rs. 5000, if he joins and contributes between the age of 18 years and 40 years. ** The contribution levels would vary and would be low if subscriber joins early and increase if he joins late. ** Atal Pension Yojana (APY) is open to all bank account holders. ** The Government co-contribution is payable to eligible PRANs by PFRDA after receiving the confirmation from Central Record Keeping Agency at such periodicity as may be decided by PFRDA. ** The age of exit and start of pension would be 60 years. ** Therefore, minimum period of contribution by the subscriber under APY would be 20 years or more. 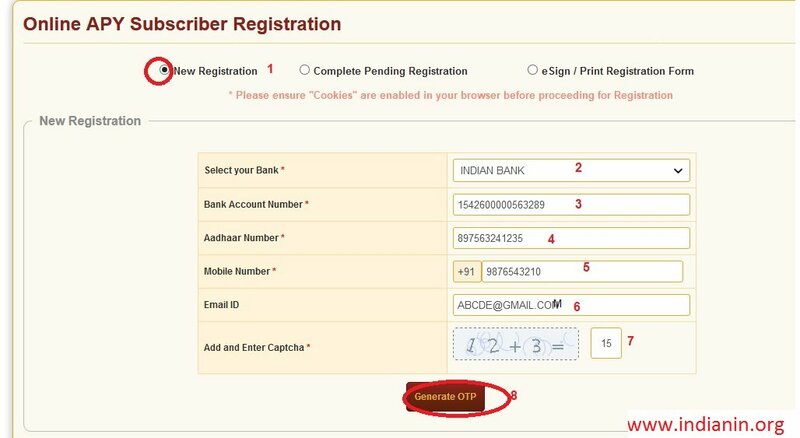 Step 9 : Click Proceed button and then generate OTP on your registered mobile number. After entering OTP, click “Continue” button. Click the eSign / Print Registration Form option then follow the below steps. Step 7 : Click Submit button to get your print out form. Click on the “APY Application” Tab in home page.APY Subscriber form will be opened. Step 7 : Click generate OTP Button. Atal Pension Yojana Online Application Form will be displayed. ** The Fill personal details, family details and generate acknowledgement number. After acknowledgement Id is generated, enter bank / branch details & account number for bank verification. 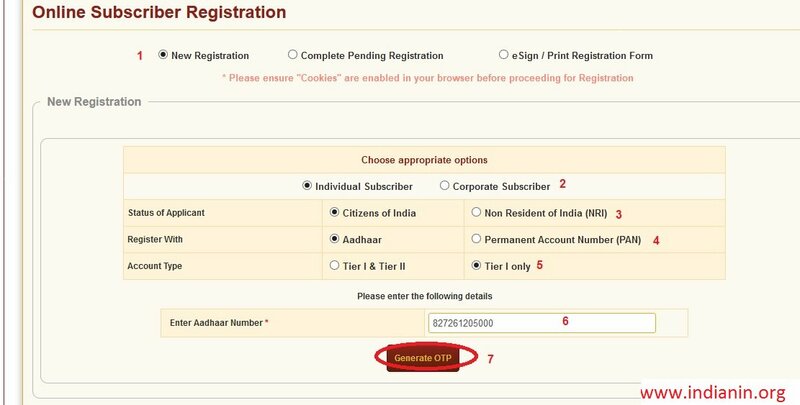 ** Next fill the pension amount, contribution frequency, nominee and upload the supporting documents and make payment to complete the atal pension yojana online registration process. ** If the registration process is successful, then bank will debit your account for 1st subscription and will generate Permanent Retirement Account Number (PRAN). 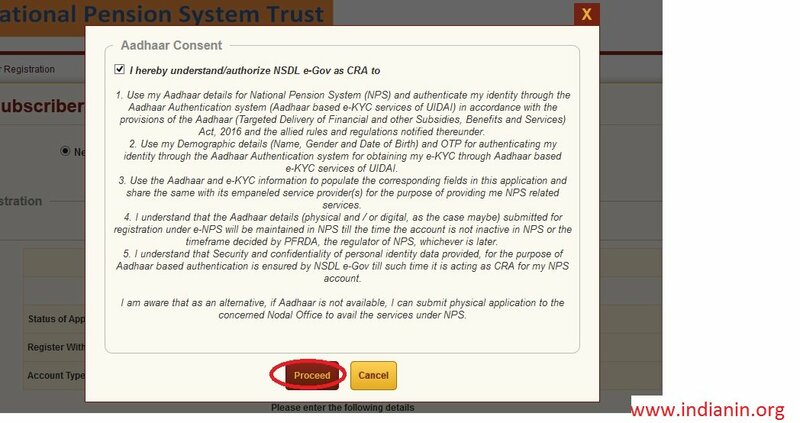 ** Finally candidates can e-sign the Atal Pension Yojana Online form for verification. ** All bank account holders under the eligible category may join APY with autodebit facility to accounts, leading to reduction in contribution collection charges. ** The subscribers should keep the required balance in their savings bank accounts on the stipulated due dates to avoid any late payment penalty. ** The subscribers are required to opt for a monthly pension from Rs. 1000 – Rs. 5000 and ensure payment of stipulated monthly contribution regularly. ** Each subscriber will be provided with an acknowledgement slip after joining APY which would invariably record the guaranteed pension amount, due date of contribution payment, PRAN etc. (iii) would also reimburse the promotional and development activities including incentive to the contribution collection agencies to encourage people to join the APY. ** Rs. 1 per month for contribution upto Rs. 100 per month. ** Rs. 2 per month for contribution upto Rs. 101 to 500/- per month. ** Rs. 5 per month for contribution between Rs 501/- to 1000/- per month. ** Rs. 10 per month for contribution beyond Rs 1001/- per month. ** After 6 months account will be frozen. ** After 12 months account will be deactivated. ** After 24 months account will be closed. ** Upon completion of 60 years, the subscribers will submit the request to the associated bank for drawing the guaranteed monthly pension. ** Exit before 60 years of age is not permitted, however, it is permitted only in exceptional circumstances, i.e., in the event of the death of beneficiary or terminal disease.